The CW is my very most favouritest TV network. It feeds me a steady diet of contemporary, high stakes dramas populated with attractive, well-dressed people faced with realistic situations we can all relate to. This commitment to realism ensures the CW isn't just entertainment. Its many shows have taught me pretty well everything I need to know about American society. It’d be rude to keep this knowledge to myself, so without further ado, here are the most important things I’ve learned from the CW. You don’t actually have to attend school. Yeah, you oughta enroll, but you don't really have to go. Feel free to skip class to deal with a super-dramatic event that might destroy the world, kill your one true love, and/or cost you your social standing. And if you wanna fall off the grid for a month or three so you can find yourself in the wilds of Appalachia, you go right ahead. Maybe you’re worried about how this will affect your college prospects. While you’re likely to experience a massive and tragic setback (unrelated to your attendance record) when you apply to your first choice school, you’ll always have a place at the prestigious local college no one ever mentioned in the first two to three seasons. And hey, the attendance rule transfers to college! You should make a show of registering for classes and joining extracurricular activities in your first year, but all bets are off after that. Start a newspaper or take over your mother’s fashion empire instead of finishing school. Get shipwrecked on a hell-island or cursed to sleep for seventy-plus years, even. It’s all good. Nobody’s ever gonna call you on your lack of post secondary education. In the unlikely event that you do graduate college, you’re probably never gonna make it to that law school interview. Sorry. Ruby's totally on your side--or is she? They’re inevitably a bad witch, an assassin, a supervillain in training, a demon intent on tricking you into starting the apocalypse, or the progeny of your most business-minded parent’s archrival. You’ll discover this just as romantic sparks begin to fly between the two of you, and the betrayal will spur you to action even as it rips a hole in your heart. Fear not! The villainous-yet-attractive newcomer will soon realize they’re on the wrong side, which bodes well for your burgeoning relationship--until they’re killed, they’re forced to leave town because their DARK PAST caught up with them, or they reveal they never actually quit being evil (ha ha ha!). Abby Griffin tells people stuff. Except when she doesn't. It’s not like they’ll take proper precautions if you tell them about the vampires who’ve moved in down the road, or the superheroic side gig that's made you seven zillion enemies including a ginormous psychic gorilla, or the life support failures that’re set to kill everyone on the space station inside of two years. Best to feed them some flimsy story about an animal attack or hallucinogens in the water or whatever. It doesn’t even need to be plausible. Loved ones are soooooo gullible. Blair Waldorf doesn't know a single poor person. Poor people are a myth. Witness the town of Mystic Falls, home to one lone poor person and a slew of high net worth individuals who own massive houses and wear couture to twenty-seven town benefit events per year. Or New York, where even the less privileged Brooklynites live in well-appointed lofts where no one ever steals the coats and bikes they leave outside their front doors. Starling City does have an entire neighbourhood packed with poor people, but that's just a plot device. You should pay it no mind. Please note, also, that all extremely rich ladies (ie, all ladies) between the ages of thirty and forty-five are required to wear sheath dresses and impractically high heels most of the time. Peplums are an optional addition from 2009 on, or 2007 if you’re a trendsetter. Extremely rich ladies who're forty-six or older may switch to Chanel suits, if they wish. 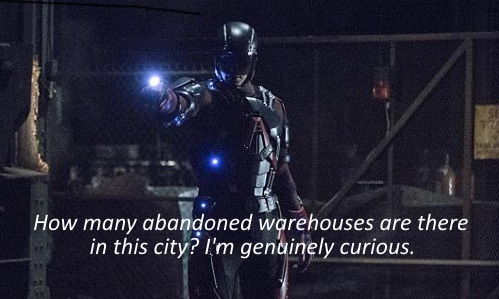 Ray Palmer asks the important questions. America is riddled with abandoned warehouses. Power plants and building sites are also liable to be empty. The owners let them lie fallow, often with lots of expensive (albeit rusty) equipment and artfully disarrayed packing crates still in them. Should you wander into one of these places, you will be forced to fight a ninja, an assassin, a demon, a psychotic vampire, a supervillain whose strengths appear to exceed your own, or the man who fake-killed your father six years ago and has returned to ensure you never learn the truth behind what happened that night. Not that he knew it until five minutes ago. Every CW character knows at least one person with a random half-sibling; ie, a previously unknown sibling who appears with little to no foreshadowing. The really (un)lucky ones know multiple people with multiple half-siblings who sprung from multiple parents’ multiple youthful indiscretions and/or extramarital affairs. These random half-siblings inevitably appear at the worst time for everyone's emotional health, so you must stand prepared to support any and all friends who find themselves dealing with this situation. Please note that full-siblings sometimes transform into half-siblings due to the power of retcon, also when the parties are least equipped to handle the emotional fallout. Ugly crying inevitably ensues. Not on the CW, Damon. While anyone and everyone on the CW may find themselves in a fake-death (or temporary-death) situation, it's worth noting that parents are the worst culprits. At least one character on every CW show has at least one parent who has faked their death at least once. Sometimes the parent in question does this to avoid a dangerous rival who was hot on their tail. Sometimes their co-parent forces them into it because they've grown tired of their partner's substance abuse and/or inability to take responsibility for their kid(s). Sometimes the circumstances of the person's fake-death were so traumatic that they develop amnesia, in which case they'll lament the lost family time once a major shock allows them to regain their memory. Everyone will hug and cry a lot while the former amnesiac whispers things like, "I never wanted to leave you.". On select occasions, parents die for real but come back as ghosts who are unable to fully communicate with their child(ren) until a Stupendous Event opens the door between life and death. Given such compelling evidence, one can only conclude that people fake their deaths and/or get resurrected all the time. The CW wouldn’t lie to us about something so important. You mean real life siblings don't sacrifice themselves for one another all the time, or go mad and burn their house down when one of them dies, or enact elaborate schemes to bolster one anothers' reputation via gossip blogs? I dunno. It all seems so legit when it happens on the CW. Haha, this was too funny to read :D Made my Tuesday. Thanks! I had so much fun researching it. This is hilarious, Memory. And all if it must be true because almost every show on the CW fits these categories. Temporary-death and fake-death are the CW's stock in trade. I've also been noticing a definite trend towards at least one guy per show having a kid he never knew about. Oh! Have we talked about how CW siblings inexplicably stroke each other's hair even though I've never seen a real-life person stroke their siblings' hair ever? IS IT REAL or is the CW misleading us? Also: I never, ever, ever tire of characters not really being dead that you thought were dead. I mean if you do it more than once with the same character it gets old, but like, as well-worn plot twists go, that's one I will love preeeeetty much every time it happens. I'm learning so much about siblings. I thought the hair-stroking thing was 300% legit, even though I've only ever seen people do it with small children and dogs. I also love fake-death so much that I keep hoping it'll happen again. Like, I never, ever trust that a character's dead unless we've seen their body with the eyes wide open and glazed over. And even then, I'm like, "Maybe they're faking, or they'll get brought back to life because of magic/angels/particle accelerators." I wish the CW would have been around when I was a young teen so I could have really absorbed these lessons. I could have used them! Thank goodness today's young people have this valuable resource. I love this. Thank you for writing this treasure.